Today, I will explain how stats affect your abilities. Some math is involved. Let us start at the beginning. There are five base stats (plus armor): Vitality, Might, Agility, Will, and Fate. These stats are indicators of how powerful your abilities are; they are used to calculate your abilities. (a) Vitality is your life. It calculates your morale and drives your defense (resistance and mitigations). (b) Might is your strength. It determines how well you swing your physical weapon. It aids your defense as a measure of how physically imposing you are to knock down. (c) Agility is how dexterously skillful you are. It determines how “slippery” you are not getting hit and how adept you are at knowing how to critically take out your opponent. (d) Will is your resolve. It calculates your power, which drives your ability to use many of your skills. (e) Fate describes a certain amount of how fortunate you are in combat. It regenerates your morale and power and affects how often you critically hit an opponent. Your abilities are categorized as (1) Morale, (2) Power, (3) Offense, and (4) Defense. Each time an action occurs (for example, you attack), these abilities come into play. Knowing your class will help decide on what abilities you should focus. I will explain some about Runekeepers as we go since that is my field. How is that ability calculated? Most of the stats versus abilities are easily calculated. Here is a table of calculations. Feel free to let me know if your class disagrees; my expertise is at Runekeeping so I don’t always get perspective on other classes. Ok, I left the Physical and Tactical Mastery out of the table above because those abilities are modified by different stats depending on your Class. Here is what they look like by class. I’m nearly certain I got these right, but let me know if you spot an error. Ok, so what do these figures mean? So, what is important for you? I can only talk intelligently about Rune-keepers, but the other Tactical classes are similar. For RKs, the three most important things to weigh when deciding which pieces of gear you desire are (1) Tactical Mastery, (2) Morale, and (3) Critical hit. The second line is (4) Defense: (a) Tactical mitigation (moors and some raids), (b) Physical mitigation (most general questing), and (c) Resistance (always good to resist elements). But as you see, I am no tank. I would hope a tankly built tank has more awareness of his defense. I count on the tank to take the blows that I cannot so that I can end an enemy quickly, or heal the tank so others can fight. Role assignment in a group is critical to success. (1) Tactical mastery is straightforward; it determines how much damage (or healing) you can do. The mastery figure represents an “increase in damage done for tactical attacks” (as a % increase in damage) and a corresponding % for healing improvement. As a RK is a prime force for dps or healing, tactical mastery is king. (2) Morale. Inevitably, the tank gets stunned, the fires of the enemy rise, or a rogue orc breaks free and the RK will need to be able to stand on her own for a moment while the team regroups. Morale is the difference between being dead or alive in that situation. You cannot heal or fight when you are dead. For every decision of gear, virtue, or relic, there is a tradeoff. Did you take Morale? Did you give up Offense? Defense? It is a matter of understanding the options and balance. For a RK, some Morale is good, though what did you give up? A RK with a high 20,000 tactical mastery and low 4000 morale is going to get thunked dead by the first bad guy that aggroes. Learn a balance; I will discuss balance more below in this article. (3) Critical is the ability that determines how often you are landing critical hits and devastating blows. Some other mathy people have built curves to determine at what level you might be better off with more Critical and less Mastery. Example, Critical versus Mastery: Let’s look at a simple example of two relics that are on the same T6 level - Adamant Gem of Lore (22 fate, 520 critical) versus Adamant Gem Precise Eye (22 agility, 520 mastery). For the moment, let’s only focus on the critical versus mastery part without stat add-ons. The fight begins, no buffs or bonuses are in place, with an extra 520 mastery, the hit would do an extra 1.86% damage. With an extra 520 critical, the hit would have an extra chance of critical +1.44%. Not showing all the work here, at most levels the Critical would win out over the course of a fight 75% of the time. All other aspects equal, 520 Mastery appears to be an even trade with 502 Critical (assuming you aren’t past a diminishing returns point, 27000 Mastery or so). However, another math nerd of the web says that a good breakpoint for RK to start deliberately choosing Critical over Mastery is around +100% Tactical. By current design (Update 6), there is a lot of logic in that and I would agree that is a good breakpoint. At 100% Tactical damage, one is near 27,000 Tactical, which is near the cap for Healing (50%). If you are pushing over 27,000 Tactical, what did you give up to get there? How do you build Dana? Back in "best-laid-plans-of-elves-and-runekeepers", I showed statistically what it looked like when going from Level 65 to Level 75 but I didn’t go any deeper. I will pick up from there and explain how I evolved and where I am heading. I will also point out where a RK might be when equipped with Isengard gear and with Moors gear. So, what happened? At the beginning of Level 75, I was working to make a sturdier solo build. As time progressed, I targeted being a more deadly force within a group while giving up very little. 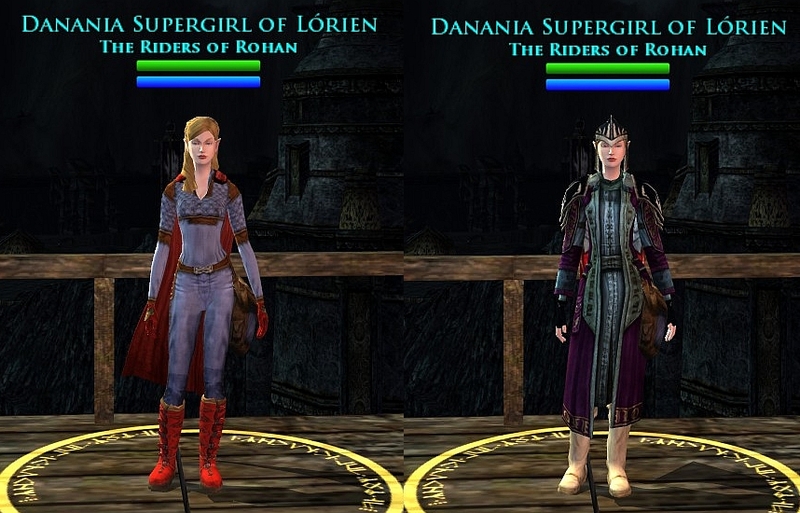 And of course, more gear options became available via Isengard raids and Great River barter options. In short, just from stats and abilities, I do +42% more damage, have +21% more Morale to work with (even though my Vitality went down), hit Critical +2% more often (even though my Fate went down). Because I traded for damage/healing output and Morale, I gave up some defense and take 8% more damage from the enemy (lower mitigations via the reduced Vitality). So, +42% damage and +21% Morale versus taking 8% more damage is a good trade for a non-tank. 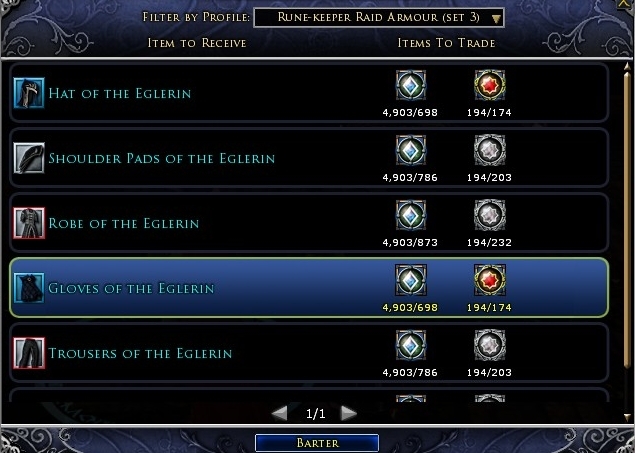 6 Raid Eglerin: This column depicts what would happen if I went with the full set of Isengard raid armor. Net result: +5.6% Tactical damage, -4.0% Morale, -1.7% Mitigation (resulting in more damage taken). It works well if I don’t get hit. 6 Moors Tranquility: This column depicts what would happen if I switched out all of my armor with the Moors Tranquility Armor set; Tranquility is the healer’s armor and has the most similarities to the Eglerin. Net result: +6.2% Tactical damage, -2.5% Morale, +0.3% Mitigation. Between the Tranquility and the Eglerin, the Tranquility makes for a sturdier build, but gives up 3% Critical chance (about 1000 Critical), which is big. Current gear and the future? Since some of you have asked what gear I am choosing, I will list my current gear with thoughts about what comes next. My objective was to be at 26,000-27,000 Tactical offense, over 8,000 Morale, and as much Mitigation as I could obtain without sacrificing the first two. Here is a shot of me “in disguise” and “out of disguise”. One thing for sure, while in the Moors, I need some dye-work for my mixed set as those pieces of black, navy, purple, and white do not match at all. 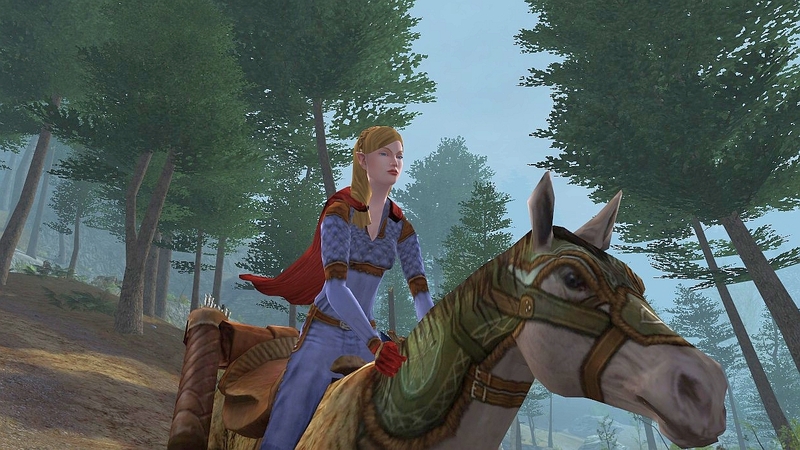 Hymne @ Cosmetic Lotro would probably be embarrassed to be seen with me. (1) Cloak: Wyrmscale wizard from Draigoch. It requires three scales from Draigoch (one win plus good roll) and a tailor. Better Cloak = Shimmering wizard via a “Broken Clasp” dropped in Saruman raid. It is the only better cloak, and I’ve never actually seen one. I’ve been told that the clasp drops 50% of the time from a Saruman win. So, one shot at a clasp 50% of the time on a once-per-week raid divided among 12 raiders in the group = not a practical target. (2) Chest: Padded Cobalt of the Moors. It is currently obtained for 6000 Moors Commendations. Mine is matched as a set of two, with the Legs. It is an interesting piece since it offers more Morale than any other RK chest piece. Better chest = (a) the new Moors gear (barter for 7500 Commendations), or (b) the Isengard chest via Saruman raid (beat Saruman, then barter 873 Medallions, 232 Seals). (c) The Clever Counselor (Draigoch series, barter for 1035 Medallions) offers the most Tactical Mastery. If you are going to the Moors, the “Audacity” of the new Moors gear is essential. New Moors chest piece is one of my first targets on returning to the Moors. (3) Legs: Padded Cobalt of the Moors. It is currently obtained for 4000 Moors Commendations. Mine is matched with the Padded Chest piece. Between the two, they give a set bonus +535 tactical and physical mitigation, which is nice. 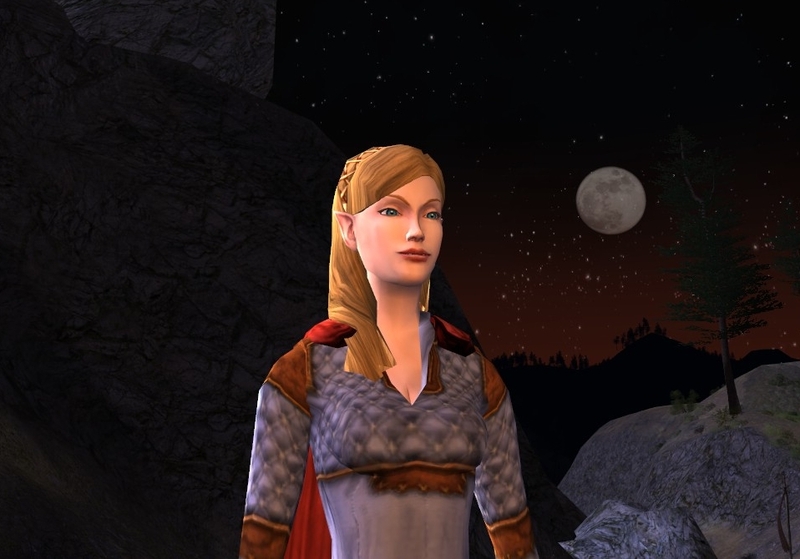 Better Leggings = As I have recently unlocked the Isengard Shadow wing leggings, I am on trajectory to barter for those leggings (786 Medallions, 203 Seals). As of today, I am at 125/203 Seals. (4) Shoulders: Isengard – Eglerin series. It barters for 786 Medallions, 203 Seals, and requires a win in the Fire&Frost wing. I currently have three Eglerin pieces, and am targeting a fourth piece (the legs). (5) Head: Isengard – Eglerin series. It barters for 698 Medallions, 174 Seals, and requires a win in the Lightning wing. (6) Hands: Isengard – Eglerin series. It barters for 698 Medallions, 174 Seals, and requires a win in the Acid wing. Eglerin series versus Erebraw - Right now, with a few exceptions (and the Audacity need in the Moors), the Isengard raid gear is some of the best gear by piece in the game for RK, and with the set bonuses only Moors gear is comparable. Of the three options, I chose the Eglerin (healer) series. The Eglerin offers more Morale; the Erebraw (lightning) and the Puignor (fire) offer better Criticals and more Finesse. It was a close call but for a full set, Eglerin (vs Erebraw) has +549 Morale and +1314 Tactical Mastery and -576 Critical. Both have good set bonuses, but Eglerin matched my objective of more Tactical and more Morale. (7) Feet: Ryscdail. This named pair of boots is a nearly-every-time drop in the Foundry (mebbe T2 only, I’ve never seen Foundry T1). Better boots = (a) the new Moors gear (barter for 4000 Commendations), or (b) the Isengard shoes via Saruman raid (beat Saruman, then barter 873 Medallions, 232 Seals). When I return to the Moors, the boots are the first gear change, and the matching Moors chest piece will be the second. (8) Necklace: Ancient Jade & Sapphire. This necklace is built with Orthanc sigil fragments. Run Isengard instances, get fragments, build up to the necklace at the Ox Clan barter merchant. Better necklace = The only necklace I have seen that is better is “Laerur”. It is available from the same Ox Clan merchant and requires a “Broken Clasp” which is a drop from Saruman (see Cloak section above for Clasp). (9) Earrings: Empowered Anduin Mendor and Glimmering earring. Empowered Anduin Mender is a barter earring from Limlight Gorge vendor in Stangard. It requires some gold and silver tokens (common from the Great River) and an unhatched Spider egg. The egg comes from “The Roots of Fangorn” fellowship instance. In my opinion, the Empowered Anduin Mender set of three jewelry pieces (earring, ring, pocket) are some of the best RK jewelry pieces available. Glimmering Earring is a barter earring from a Galtrev vendor. I chose it for its excellent Morale. Better Earrings = The Mender is the tops, but the Empowered Anduin Sage earring is a good option (same vendor). The Mathom Tender (skirmish raid drop), Great spider earring (Roots of Fangorn drop), and the Great River earring of Will (jeweler crafted) are also very strong choices. The Empowered Anduin Sage is my target to replace the Glimmering. (10) Rings: Empowered Anduin Mender and Willful Defence. Empowered Anduin Mender… see earrings above. It is tops. Willful Defence of the Moors was the tops before the Great River expansion. I am not sure its current barter price; it costs Moors Commendations. Better Rings = These rings are two of the best rings available. However, there are a few others depending on your Abilities’ need, including Band of the Codex Archivist (skirmish raid drop), Limlight Tactician Ring (simple token barter in Stangard), and Empowered Anduin Sage (bartered with Spider eggs like the Mendor ring). (11) Bracelets: Limlight Tactician and Thoughtful Counsel. Limlight Tactician Bracelet is a simple token barter item from Stangard. It requires some reputation with the Stangard-ians to obtain (Limlight Gorge rep I believe). Thoughtful Counsel is a skirmish raid drop from the Prancing Pony skirmish. Better Bracelets = Of all my gear, I feel that my Bracelets are the least. However, I have not seen much better for a RK. The Root Poisoner's Bracelet is a good blend but gives up Vitality and Mitigations; it is a random drop from the Roots of Fangorn chest. “Oaths spoken” (a simple Galtrev barter item) was the last bracelet I had before Limlight. (12) Pocket: Empowered Anduin Mender. 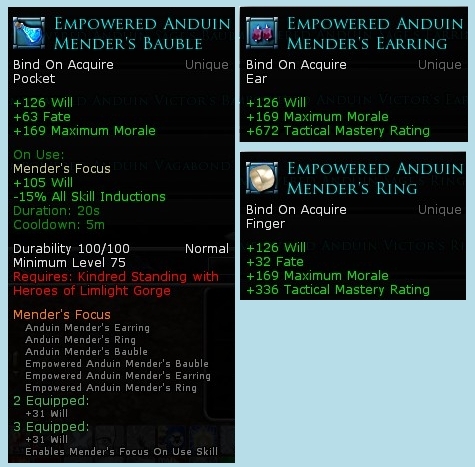 This one is the third piece of the Mender set, along with the Earring and the Ring. Better Pocket = My set of three is complete, and I shall not want. However, if you are working toward a set, Angolwir (Dunland quest reward), WesternSeas Navigation Chart (skirmish raid drop), Galadrhim Medicinal Pouch (skirmish raid drop), Gold-inlaid flask (skirmish raid drop), and Empowered Anduin Sage (same vendor as the Mender) are all good options. (A) 125/203 Seals until Eglerin Legs. (B) One Roots Spider egg = Empowered Anduin Sage Earring. (C) Return to the Moors and get Tranquility Chest and Boots. For the Moors “Audacity” alone, keep obtaining more Moors gear. (D) Saruman and his goodies (cloak, necklace, chest, boots) are written off unless the unexpected ensues. Eventually, I may gain victory over Saruman. And then, I would need 542 Seals to complete the Isengard set. It has taken 7 months to obtain 676 Seals for the first 3 and a half pieces. But if I did get the rest of the Seals, would it be better than my current build? (E) RK gear is DESIGNED to make a more deadly but more fragile, glass cannon. You can see by comparison to the “Level 75 begin” column that the high end pieces are stripping away defense to offer even more explosive Offense. To combat that issue, I will flip 4 out of 5 traits, basically all the Will I have cherished, to traits that offer better defense. In effect, I give up very little because the better gear offers all the Offense I was targeting. Flip to Honor, Fidelity, Innocence, Tolerance, Zeal. (Finis) Changing these four pieces plus the traits; Net result = +9.4% Tactical damage, +0.4% Morale, +4.8% mitigation. Against objective: 26,000-27,000 Tactical offense, over 8,000 Morale, and as much Mitigation as I could obtain = 3 wins. As I build the Moors set, I will look for ways to optimize and pull out a smidge of Tactical Offense to replace it with a helping more of Mitigations and Critical. Update January-2013: Well hello! There was a lot of detail here; however, I went into specifics about Mastery versus its diminishing returns and show more math at lotro-math-mastery-diminishing-returns?. If you stuck with me so far, you might find that one even more interesting. It ran a bit long. Focus on the balance of a few key aspects and use the math from the first table to map how to optimize those variables ...or just guess, hehe. Growing up, I optimized by going from crafted set to crafted set. Specifically, level 16, then 22, then 32, then 42, then 51, then 58, mixed in some Moria gear, then level 75 Crafted (mixed with some Moors). Note that those levels are the breakpoints for the crafted tiers = big bang with few mats. Doing it again, I would do it almost exactly the same; except if I didn't stay in Moria long enough to get a set (RK Moria gear is really well built), I would probably shift in some level 65 (malledhrim) and other crafted Dunland (http://www.danania.net/2012/02/welcome-to-my-tailor-shoppe.html). Level 58 crafted to level 75 crafted is a big jump. Can't think; maths will eat me. Head to the next post. No carnivorous maths there; only pretty ponies. I watch the blog stats and notice that this is the most reviewed post I have written. Thanks so much for saying something. I look back at it now and wish I had written the "Current gear" section a bit clearer. Going from level 75 to level 85, I am certain I will do another gear related post, and I will focus on making it better. Now that I understand how to put pages on my blog, I will explore presentation. Here is my take on RK Virtues: Read both sets before making a decision that might be good for you. (1) solo traiting: Zeal, Loyalty, Wisdom, Confidence, Ideality = max Will (for tact mastery & power), good morale, good resistance. (2) raid traiting: Zeal, Fidelity, Honor, Tolerance, Innocence = Near Max tactical mitigation, strong physical mitigation, good morale, and good resistance. The reason Raid RKs trait the way they do is solely because of Defense, tactical mitigation to be precise. Do it. It is important. Solo set = 2.6% better tactical mastery, 0.1% more critical, 2.3% more resistance, +30 morale, +264 power. So, in Raid, you give up a bit of mastery (assuming you aren't in the grey soft cap zone) to not get one-shotted by Saruman, and you are thankful for it. In truth, I always trait using this Raid trait set (Zeal, Fidelity, Honor, Tolerance, Innocence). Unbuffed, my tactical mastery is near the grey zone at 27k, so more Will is not as big of a benefit as the stronger defense. BTW: I would not retrait virtues between DPS and Healing. My answer would be the same. Oh good Anonymous, you are very welcome. Of course, the figures I tossed out above apply to Virtues at 14, and percentages at level 75. For below level 65, I would go with the "solo virtue set". A big reason is that the RK gear sets and crafted gear tends to be less specialized and offer a more robust defense. You will enjoy having the greater Will offered by the solo virtue set suggested. Very Nice write up, question for you though, what is your DPS like? Lightening DPS for me is usually about 1,500 and Fire 2,000-3,000 (depends on guard and if they continue to pull non-stop). I have seen other RKs in ToO getting 2,900 DPS (without Blade-Brother), I'm always looking at builds and playing with gear/jewellery and I think it comes down to skill rotation. I have looked and asked and yet the advise I have been provided yields me less DPS with there rotation. (1) I have not used an Analyzer in ages to accurately measure my DPS; I have played RK long enough and with its variations that I can go by feel while adventuring/skirmishing. I also have in mind what skills to use based on my build and have numbers in mind for what I should be able to achieve (based on spreadsheet theoreticals... I do like my spreadsheets). (2) You are exactly right about the skill rotation. The foundation of your build is choosing traits. Then, build onto that using a good balance of Tactical Mastery and Critical, through your choices of gear/ jewelry/ LIs/ legacies/ relics. But, to achieve the best DPS, it is a function of skill rotation. As you know, you can see in the description which skills cause the crit stacking and bonus synergies with other skills. I can feel that my skill rotation rhythm is working when I am soloing and consistently hitting over 5k with Shocking Words and 10-15k with Epic Conclusion. Perhaps there is more envelope to be pushed since my LI is a 2nd Age and has no star-light crystals, but at this point I am satified. Mebbe, I will look to maximize more in the future. (3) While I dabble in fire, my primary build is Lightning traited (7-deep) and do I build my LIs with that as primary focus and fire as secondary. It suits my playstyle: mobile, aggressive, solo/Moors, flexible. Thanks for the comments. It would be great to know more about what Fire traits and Legacies you choose when you are maximizing Fire! :D Ride on! Thanks for the response, though with out Combat Analysis, then how can you be sure your build or approach to different builds are working effectively or not? Yeah sure in a skirmish and soloing you might be fine, but when DPS really counts (or healing) you NEED those numbers. I am very interested in what you are actually doing in different situations before I go ahead and change. Here are my stats for each DPS build, not listing healing because its pointless, it caps at 50% so just means less tactical mastery and more morale/power/mitigation. As you can see, I've spent a lot of time on my Rune-Keeper to get different builds set up. I hope you consider installing CA and share with us your numbers and skill rotation. That would be nice to compare builds and rotations. I will load CA again in my "spare" time to give you something at which to look, but it is not likely to happen before Rohan as I am fresh out of spare time the next few days. Looking at your numbers, the Tactical Matery alone would indicate that your Fire build has a distinct advantage over your Lightning build. Depending on where you are on the mastery/dps slope (I don't know because I have never pushed a build past 30k), your Fire build should be as much as 14% more DPS. That isn't even counting any differences between the actual DPS output of the LIs themselves. I put my character sheet and an in-depth look at my gear, traits, etc on a page called "Danania @ 75". See top tabs. Im leveling a Runekeeper at the moment after reaching 85 with a hunter. You seem to know most- why is it that a runie gets so much physical offence? We only have tactical skills? Perhaps I got it wrong but playing the hunter I went for physical all the way since I rarely use tactical skills. Anonymous, That is a great question; why does a RK get physical offense; why would a RK care about physical mastery at all?? When any player is not using skills, they are in attack mode and all attack mode is considered "Melee" or "Ranged". Both melee and ranged are "Physical mastery" based. These melee and ranged attack modes are also the foundation for some of the other classes (not RK). You can see that all players are allowed "best skill" x10 for physical mastery, and it is for this attack/autoattack reason. That said, physical mastery is just along for the ride... you get it because of your Will score; no RK gear will ever modify physical mastery alone. ICPR gained from Fate is in fact 30 * sqrt(Fate) for now. After Update 10 it will be nearly 5,5 * Fate. Thanks Corcaroli! I'm going to change this article to reflect this.